In this study, the concentration of sub-micron particulate matter (PM) and its associated metals concentration have been discussed. Monitoring of sub-micron particulate matter has been made by using Leland legacy sample pump with five-stage Sioutas Cascade Impactor. Total, 150 samples from urban and sub urban areas of western part of India were analysed using ICP-OES. For PM1.0–2.5, PM0.50–1.0 and PM0.25–0.50 the average mass concentration ranged from 28.33 to 38.86 µg m−3, 30.46 to 39.44 µg m−3, 25.43 to 46.30 µg m−3 for indoor environment, while outdoor environment concentrations ranged from 23.15 to 54.01 µg m−3, 22.38 to 36.20 µg m−3, 22.32 to 44.30 µg m−3, respectively. On the other hand, in sub urban area, the average mass concentrations ranged from 23.15 to 69.44 µg m−3, 27.72 to 51.73 µg m−3, 17.72 to 54.01 µg m−3 for indoor environment, while for outdoor environment, the average mass concentrations ranged from 30.86 to 77.16 µg m−3, 23.15 to 54.01 µg m−3, 24.25 to 46.30 µg m−3 for PM1.0–2.5, PM0.50–1.0 and PM0.25–0.50, respectively. Among all eight toxic metals, Al and Fe were found to be abundant. Human health risk factor also being calculated which showed that these metals were threat to human life. The sources of the sub-micron particulate matter associated metals in outdoor air were found to be the emissions from industries, vehicular activities, and dust from construction sites and in indoor it was mostly from cooking, cleaning and other human activities. In air pollution research indoor air quality (IAQ) evaluated by particulate matter is one of the topics of the major concern . Generally, most of the people spend their time in indoor environments (i.e. office, school, shopping mall restaurants etc.) [9, 19]. For the health studies point of view, monitoring of particulate matter (PM) has been focused on concentration of fine fraction of PM [10, 19]. Particles with aerodynamic diameters < 100–200 nm defined as airborne ultrafine particles and often related to adversarial health effects as they can penetrate deep into the lung tract and further transport to other parts of the body [7, 39, 41, 43, 44]. Primarily the two size mode Nucleation and Aitken are lowest size particle modes and are classified under the category of ultra-fine particles. The smallest Nucleation mode particles are the particles with aerodynamic diameter < 30 nm and designed from gas phase vapours through nucleation. Further the growth of nucleation mode also gives rise to Aitken mode particles. They are also generated by a variety of man-made sources and the size of these particles ranges in between 30 and 100 nm  The Accumulation mode is the mode which gives rise to major sub-micron particles that are evolved from Aitken mode being a key source with the help of two process i.e. coagulation and condensation. Looking at the studies of indoor PM it has been identified that higher concentration of PM in indoor environment especially during domestic activities than outdoor environment [8, 18, 19]. Moreover, there are evidences of higher levels of PM as high as 300 µg m−3 reported when the sources like smoking found for at least half an hour until it completely burnt off. Further, the indoor average concentration of PM is also found to be exceeded to 20 µg m−3 for 24 h [19, 38]. The levels of PM not only depend on emission sources indoors but are also related to human activities such as cleaning, working, cooking etc. and it is also affected by the mere presence of the occupants indoors [15, 19, 38]. The largest sub-micron particles efficiently infiltrate from outdoors to indoors, whereas lowest size ultrafine particles in the size range < 100 nm get disperse easily outdoors . Though this scientific concept of ultrafine particles containing trace metals in outdoor air is impartially new, even though the studies on ultrafine particulate and its concentration are reported well . Exposure to air pollution is considered to be the world’s largest environment health risk [17, 42, 45], it is globally accepted that smaller particles call for special attention from health point of view and thus should be specifically focused from an epidemiological context . Information on pollutant load of size segregated study of particulate matter (PM2.5–1.0 and PM1.0–0.5) is still sparse. PM from these sources may contain hazardous metals and can have carcinogenic effects. The present study aimed to address the indoor outdoor concentration of three size sub-micron mode particulate matter and their associated toxic metals concentration. The findings of the study analysed the values of toxic metals concentration in different size of sub-micron PM in both indoor and outdoor environments. Moreover, this is the first time when sub-micron particles study has been conducted in the indoor and outdoor air of two different microenvironments. 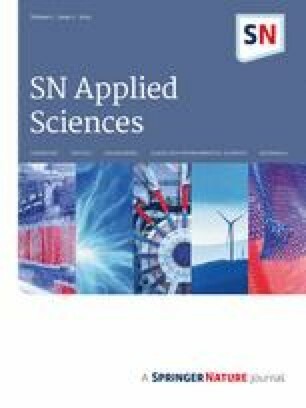 Thus the results of this study will give a better view of the air quality with reference to size resolved particulate concentrations at different microenvironment that could help the health officials and general public to gain insight the toxicity of metal bound particles with a better understanding to control them. 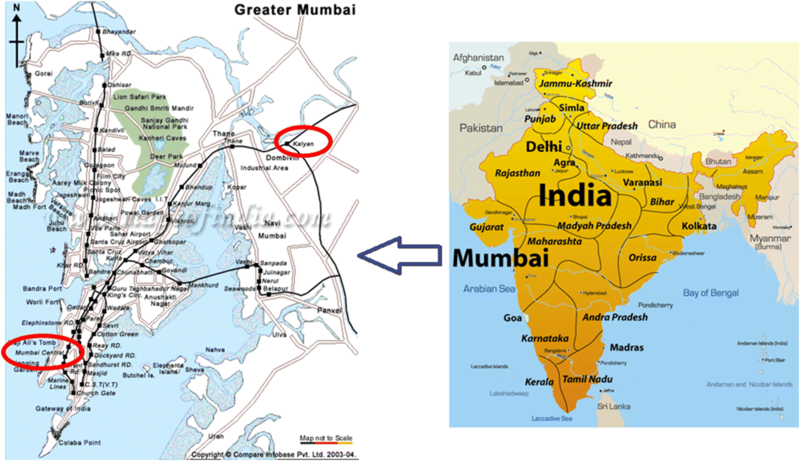 Mumbai which is the capital of Maharashtra state lies on the western coast (latitude 19°4′33.54″N & longitude 72°52′39.56″E) of India. It is the most populous city of India and it covers a total area of 603 sq km. Number of plants (i.e., petrochemical, compost, and power plants) have been located at the south-eastern corner. It also has number of working industries such as dyeing, textile, pharmaceutical, paint and pigment and metal. (UN World Cities in 2016 ). Samples were collected from the two locations at Mumbai which represented urban and suburban site of Mumbai. An urban location of sampling site was selected in the heart of the city i.e. 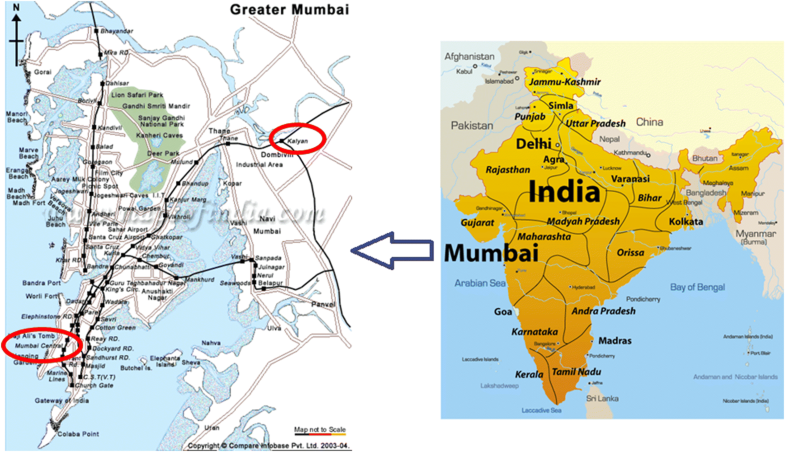 Mumbai Central which faces the heavy traffic throughout the day and is densely populated whereas, a sub-urban site was selected far from the city and was typically located in the sub-urban of Mumbai named as Ulhasnagar about 55 km away from the urban site (Fig. 1). Simultaneous indoor–outdoor air samples were collected from urban and sub urban locations of Mumbai for a duration of 6 months i.e., August 2016 to January 2017. Sampling was done once in week so there were total 150 samples collected from both locations. Leland Legacy sample pump (SKC Cat. No. 100-3002; Inc. Eighty-Four PA USA) with five-stage Sioutas Cascade Impactor was used to collect PM in the size range of PM1.0–2.5, PM0.50–1.0 and PM0.25–0.50 on 25 mm PTFE filter paper with pore size 0.5 µm. The instrument was set at air flow rate of 9 l min−1 for 24 h. All the filter papers before and after sampling were first conditioned by keeping them in desiccator which was equilibrated at temperature of 20–30 °C for 24 h and were weighed thrice on a six digits weighing balance (Contech, CAS 234) with the sensitivity of ± 0.2 mg having capacity of 230 g.
After post weighing the exposed filter papers were transferred to a round bottom glass beaker for digestion. In each beaker, containing the filter papers, 5 ml concentrated HNO3 was added and then they were kept on hot plate for 90 min at 40–60 °C  and it was made sure that the beaker containing filter papers and HNO3 should not be dried up during the digestion processes due to the evaporation of nitric acid. As the digestion process got over all the samples were allowed to cool and the filtrate was then transferred to a 10 ml volumetric flask using 0.22 µm filter paper and volume is made up to 10 ml using Millipore water. Blanks were also used during the process and treated same like the test samples. Once all the samples were ready they were further analyzed for eight elements on Inductively Coupled Plasma Optical Emission Spectrometer (ICP-OES; ICAP 6300 Duo). Stock solution having concentration of 1 mg ml−1 (Make-Inorganic Ventures, USA) were used for calibration standards, after serial dilution. Millipore water was used for dilution. 2% acidity using HNO3 was maintained in all the standards. 2% supra-pure nitric acid was used as calibration blank. Calibration standards i.e. one set of multi-element standard with eight elements and other with five elements, their concentration range (0.1, 0.2, 0.5, 1, 5, 10 ppm) used for getting calibration curves. Table 1 shows the Quality control and quality assurance parameters of analysed elements with their minimum detection limit. About 10–12% samples were spiked with a known volume of metal species to check the recovery efficiency of the analysed metals and the results of the same were found to be more than 95% for all the metals. The results of recovery efficiency were found to be under 2% (Table 1). Further to ensure the quality control the standard solution analysis was done at least ten times. The compendium of methods for the determination of inorganic compounds in ambient air were followed to do the calculation of the analysed metals concentration in air samples as reported by USEPA . 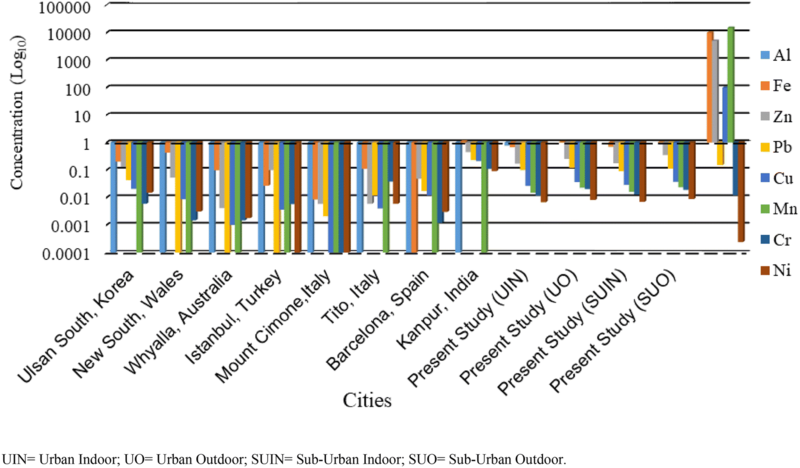 Table 2 depicts the average concentration of PM in both indoor and outdoor air home at urban and sub urban site for all three size of particles (i.e. PM1.0–2.5, PM0.50–1.0 and PM0.25–0.50). The range of the particle concentrations at urban site in indoor air were 28.33 to 38.86 µg m−3, 30.46 to 39.44 µg m−3, 25.43 to 46.30 µg m−3 for PM1.0–2.5, PM0.50–1.0 and PM0.25–0.50 and at outdoor it ranged from 23.15 to 54.01 µg m−3, 22.38 to 36.20 µg m−3, 22.32 to 44.30 µg m−3 for PM1.0–2.5, PM0.50–1.0 and PM0.25–0.50 respectively. Whereas, at sub-urban site it ranged from 23.15 to 69.44 µg m−3, (PM1.0–2.5) 27.72 to 51.73 µg m−3 (PM0.50–1.0), 17.72 to 54.01 µg m−3 (PM0.25–0.50) in indoor and at outdoor it ranged from 30.86 to 77.16 µg m−3, 23.15 to 54.01 µg m−3, 24.25 to 46.30 µg m−3 for PM1.0–2.5; PM0.50–1.0 and PM0.25–0.50 respectively. The concentrations of particulate matter at sub-urban site were found to be higher than urban site apart from the concentration PM0.25–0.50. At urban site, the concentration of PM0.50–1.0 and PM0.25–0.50 were found to be higher in indoors than outdoors. The probable reason for the varied concentration at these sites for individual particulate matter in indoor and outdoor may be the local emission sources which had been resulted into the enhanced concentration for individual particulate matter concentration. The Sum of the Total Particulate Matter (STPM) was 103.10 µg m−3 and 108 µg m−3, while at sub urban site it was 113.05 µg m−3 and 123.58 µg m−3 in indoor and outdoor air, for PM1.0–2.5; PM0.50–1.0; PM0.25–0.50, respectively. The concentration of eight analysed elements has been presented in Fig. 2. Al and Fe were the two crustal metals which were dominated at both the sites in all three size PM. Further the most dominated trends of metal concentration for PM1.0–2.5; PM0.50–1.0; PM0.25–0.50, particulates were Al > Fe > Zn > Pb > Cu > Mn > Cr > Ni in indoor and outdoor air at both the location homes. Whereas the above trend was found to be varied for the concentration of Mn, Cr, and Ni. The percentage of Al and Fe were ranging from 35 to 43%; 38 to 51% and 41.22 to 43.87%; 37 to 38% at urban site home for all the metals in indoor and outdoor, whereas at sub-urban homes it was 41 to 46%; 33 to 42% and 41 to 47%; 34 to 38%. To study the relationship between indoor and outdoor pollutants, Indoor/outdoor (I/O) ratio and Indoor/outdoor correlation coefficient were calculated. The average values of I/O ratios and the correlation coefficient for the concentration of elements in three particles size matter are shown in Figs. 3 and 4. Furthermore, Paired-sample t-test was also applied in Indoor-outdoor concentration of metals to confirm whether the I/O ratios were significantly higher or not. The range of the indoor/outdoor ratio for PM1.0–2.5, PM0.50–1.0, PM0.25–0.50 was 0.53 to 2.07 and for metal concentration it was 0.09 to 1.18 for urban and sub-urban site. Further, from the table it can be observed that Al, Fe, Zn and Pb were the dominant elements in both indoor and outdoor air of all three particulate size matter at both the location homes. High indoor concentration of elements especially for Al, Fe, Zn and Pb in addition to those of other elements with the same origin such as Cu, Cr, Ni and Mn suggest high transport rates from outdoor to indoor environments for these elements. It was further confirmed from the significant correlation values (P < 0.05 at 95% confidence interval) between indoor and outdoor concentrations and also by the results of the paired-sample t-test (P < 0.05). Pearson correlation is a statistical tool used to determine relationships between metal concentrations of each particulate size. This technique can be used to hypothesize the probable sources on the assumption that two or more species correlate to each other either because of a common source or because of the atmospheric condition. The Pearson correlations for metal concentration in each particulate size in indoor and outdoor air are shown in Table 3 for urban site and Table 4 for suburban site. From the table, strong correlation among all the metals in indoor air in PM1.0–2.5 as well as in outdoor except for Zn with Ni can be observed. The correlation among all the metals were highly significant (P > 0.01; P > 0.05). The probable source of these metals might be from re-suspension of road dust  and further transported to indoors as the correlation and indoor/outdoor ratio for this size particulate matter was lesser than unity. The significant correlation was also obtained among Cu, Ni, Pb, Zn and Al in indoor air in PM0.5–1.0 and Cr, Cu, Fe, Ni, Pb and Zn in PM0.25–0.5 in indoors. The probable reason for this correlation might be the generation of these metals from the household dust and cooking activities . At outdoor, Fe, Ni, Zn, Al, and Mn were correlated to each other in PM0.5–1.0 and Cr, Cu, Ni, Fe, Zn, Al and Mn were correlated in PM0.25–0.5, the probable reason of this correlation might be a common source of combustion from diesel vehicles . 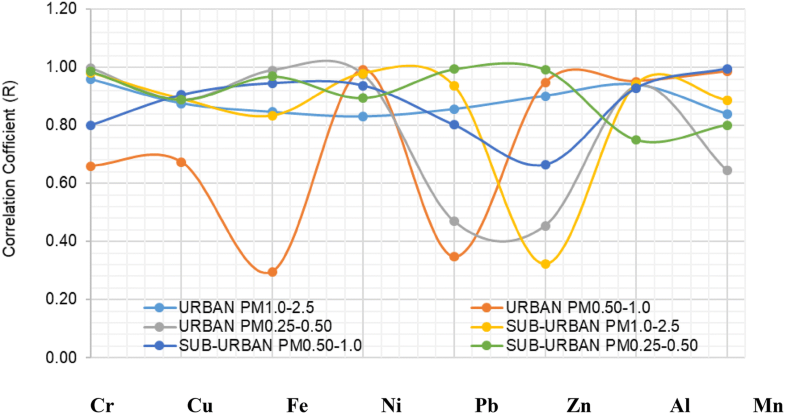 At sub-urban site, the indoor/outdoor correlation of PM1.0–2.5 particulate matter showed the same pattern as that at urban site except Zn which does not showed correlation with any metals in outdoor samples (Table 3). This correlation further classified the same source as at urban site i.e. re-suspension of road dust  and would be transported indoors from outdoors through infiltration. In PM0.5–0.25 and PM0.25–0.5, in indoors Cr, Cu, and Fe were correlated among themselves and this might be attributed to household dust emitted by walls, cleaning, cooking other human activities [11, 22, 23]. At outdoors in PM0.5–1.0 and PM0.25–0.50 Cr, Cu, Fe, Ni, Al and Mn were found to be correlated to each other significantly and might be attributable from the tyre of the vehicles which is considered as non-exhaustive traffic sources . where Cx and Cref are indicative to the concentration of metal and reference element in air and crust respectively. For current study, Al was chosen as the reference element. The sum of the concentrations of the rare-earth elements was also suggested as a suitable reference quantity [19, 39]. By definition, the enrichment factor closes to unity (EF = 1) indicates, that the element considered did originated from the soil . The present study discusses the factors affecting the uncertainty of assessing the origins of metals accumulated in air and soil, when EF < 10. If EF > 1 indicated the remote sources, while the linear correlations most probably indicated these metals originated only from the local soil. At urban site the values of EF ranged from 0.15 to 650 in indoor and outdoor whereas at suburban site it was found to be 0.12 to 864 for both indoor and outdoor for PM1, PM0.5 and PM0.25 respectively (Table 5). Five contamination categories are generally recognized on the basis of the enrichment factors EF < 2, depletion to mineral enrichment; 2 ≤ EF < 5 moderate in enrichment; 5 ≤ EF < 20 significant enrichment; 20 ≤ EF < 40-very high enrichment; EF > 40-extremely high enrichment. In the present study the trend of elements for EF values were Mn < Al < Fe < Ni < Cr < Cu < Zn < Pb at urban site whereas at sub-urban site it was Mn < Al < Fe < Cr < Ni < Cu < Zn < Pb. Mn < Al was depletion in metals; Fe, Cr was moderate; Cr, Ni was very high; Cu, Zn, Pb was extremely high at both sampling site (urban and sub-urban site). 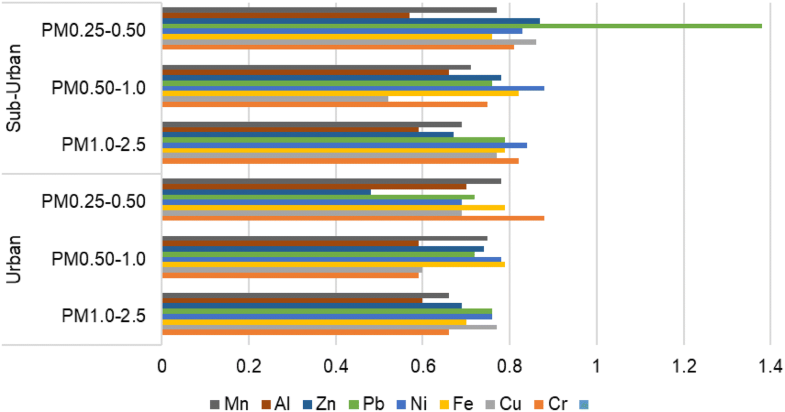 Highest value of six heavy metals (Al, Fe, Pb, Cu, Cr, Ni) were found at urban site whereas two metals (Zn and Cu) were found to be higher at Sub-urban site. Overall the results showed that Fe, Mn was crustal originated Cr, Ni was moderately enriched whereas Zn, Pb and Cu was highly enriched which has anthropogenic sources for all size fraction at both the sampling locations and these results were found to be in agreement with some of the recent studies carried out in India and other parts of the world [6, 24, 33]. Further the above trends were also correlated well with the sources which were discussed through the inter correlation of the metals and concluded that all the metals at these sites were had their sources in indoors as well as outdoors. where c = pollutant’s concentration (µg m−3), IUR = the inhalation unit risk (µg m−3), AT = the average time for carcinogens (70 year × 365 days year−1 × 24 h day−1), ET = the exposure time which was 24 h day−1. Carcinogens are pain-staking non-threshold, sense exposure of any number of carcinogens will cause cancer and the secure quantity of carcinogen is “Zero”. The data of carcinogens types and the IUR of metals is taken from the USEPA data base for IRIS (Integrated information risk system) . If the range of risk assessment falls between 10−6 and 10−4, contamination does not make carcinogenic risk . ECR of metals was calculated by using Eq. (1) and outcomes are shown in Table 6. Three metals including Cr(VI), Ni and Pb are known carcinogens through inhalation pathway. Table 6 shows the Pb value for PM1.0–2.5 was quite higher at urban site for both Indoor and outdoor compare to sub-urban sampling site while for PM0.5–1.0 and PM0.25–0.50 the trend followed as urban to sub-urban sampling site. Further Cr value for PM1–2.5 and PM0.25–0.50 were found to be higher at indoor in sub-urban site in comparison to urban sampling site (4.73E−05, 3.55E−5) respectively whereas in PM1–2.5 concentration of Pb was elevated in urban site at outdoor (7.89E−5). Concentration of Cr was found higher in indoor for PM0.5–1.0 at urban site (5.03E−5) while it was higher at outdoor in sub-urban site (7.94E−5). Ni value for PM1.0–2.5 and PM0.25–0.50 found similar at urban and sub-urban sampling site but PM0.5–1.0 was found quite higher at outdoor (7.01E−7) in urban site comparing to sub-urban site (4.73E−7). Total average concentration of metals ECR value for PM1.0–2.5, PM0.5–1.0, PM0.25–0.50 were followed the trends as Cr > Ni > Pb at both sampling site urban and sub urban. From Table 6 it can also be seen that the values of ECR were found to be higher for outdoor in comparison to indoor at both the location, Further the similar trends of the ECR values were also observed in some other latest study carried out in India and also in the largest city in Korea [12, 16, 35]. Moreover calculated values were within the receivable range but it can be threat to human health. Knowing the fact that the concentration of particulate matter varies significantly, it is because of the sampling artefact, emission sources as well as the degree of impact of these sources at the studying area. Nevertheless the comparison is of great use for knowing the levels of pollution in different parts of world and to also compiling the data set obtained in the different parts of the world. Thus to compare the data collected in this part of India, studies conducted for PM1.0 and PM0.25 particulate matter in India and other parts of the world were taken into account. Figure 5 showed the comparison in PM0.25–0.5 whereas Fig. 6 captured the concentration of heavy metals analysed in PM1.0–0.25 sample. As it has been mentioned in the beginning that this is the first time in India when the sampling of sub-micron particles has been conducted in indoor and outdoor air, therefore this data has been compared with available study for PM0.25 and PM1.0 whereas PM0.5 studies are not much conducted and are not in the knowledge of the authors. One of the studies in PM0.25 which has been used to compare the heavy metals concentration in indoors and outdoors air with our study also reports the data from the School of Barcelona. On comparing our PM0.25–0.5 results with study conducted in Indoor and outdoor air in Barcelona School and with the outdoor study conducted by Saffari et al. at Long Beach, Los Angeles, Riverside and Lancaster. The metal concentration levels of Al and Fe at urban site were found to be six times higher from the concentration levels found in Barcelona and they were two times from the study conducted in Los Angeles in outdoors by Saffari et al. . There are total eight studies used to compare the results of PM1.0–2.5 metals concentration including India (Fig. 5). The concentration of Fe, Zn, Pb, Cu, Cr, and Ni were all found to be higher in comparison to other studies conducted in Kanpur India, Barcelona Spain, Tito Italy, Turkey Istanbul, Whyalla & New South wales Australia and Ulsan South Korea. Further the results of the present study were also compared with the permissible limit of each compound proposed by USEPA, NIOSH and OSHA. The concentration of Al, Fe, Zn, Mn in PM0.25–0.5, and PM1.0–2.5 in indoor and outdoor were not exceeded more than the permissible limit levels. Ni and Cr are the two elements comes under the carcinogenic category and in the present study the outdoor concentration of Cr at both the locations were very close to the permissible limit whereas in indoor it was found to be exceeded ten times more than the prescribed permissible levels of Cr. The Ni concentration was also more than ten times higher in indoor and outdoor air of the homes than the prescribed permissible levels of Ni for ambient air concentration. 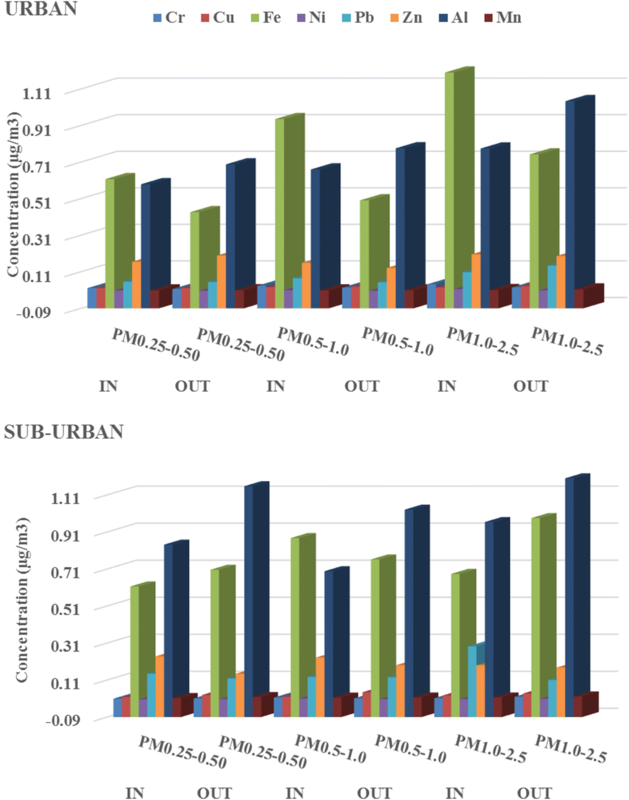 The overall comparison of our metals concentration and the comparison of the permissible limit indicate that concentration of heavy metals found to be associated with sub-micron particles in indoor and outdoor air of the homes at two locations in Mumbai, India is poor while compared to the studies reported from different parts of the world. This also gives an indication of the large emission sources from uncontrolled industrialization, increased vehicular population as well as from the other anthropogenic activities. In the present study, the influence of metals were more favourable at sub urban site as compared to urban site. The reason for the same is due to rise in many small industries at sub-urban sites. Al, Fe, Zn and Pb were the dominant elements in both indoor and outdoor air. ECR showed high levels of Pb for PM1.0–2.5 in both indoor and outdoor atmosphere at urban site which can cause lead poisoning or Pb causing diseases. It stated that Pb was more common and it occurred mostly in PM1.0–2.5. From the literature comparison, it can be seen that Ni and Cr meeting the permissible limit which are carcinogenic or toxic to human health. Study of different particulate sizes gave a clear picture of sub-micron particles get entry into respiratory tract and its ill-effects on health. This study is not enough to detect the presence of toxic metals, their size (as smaller the size more is the impact) and sources but it requires more detailed sources which contributes to ambient air and thereafter affecting the environment and human health. Furthermore, study of more fine particulate matter in indoor and outdoor environments are expected which will enhance the researchers to look after the ill-effects of these particulate matter in near future. The authors acknowledge the support of BARC MoU No. ACS/RKS/MoU/201 sanctioned to the College. We would also like to acknowledge Dr. Manisha V. of BARC analytical division team for her whole hearted technical support. The author is also thankful to the Principal Wilson College for providing the necessary facility. We also acknowledge Dr. Michelle Phillip. Head, Department of English Wilson College for checking our manuscript for English language usage.